95% of organizations of all sizes admit to making bad hires every year, according to a recent talent acquisition study by Brandon Hall Group. Nowadays, companies need to be able to compete on a global scale. 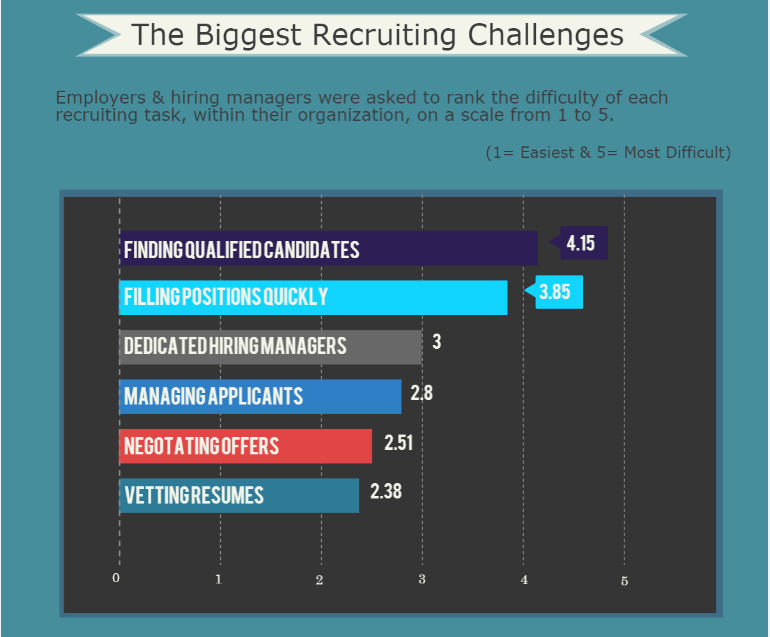 To meet increasing demands from their business, they oftentimes end up filling positions rapidly. However, these hasty hires can be risky business and may end up being more trouble than they are worth. The big questions are: What constitutes a bad hire? And, what is the true cost of a bad hire both short-term and long-term? Most organizations don’t have a clear way of answering these questions or defining cost-of-hire metrics. The short-term cost of hiring an individual can add up quick and includes everything from job advertisement fees, recruitment staff fees, third party recruiter fees, interview costs and technology costs. Additionally there is the time you actually spend interviewing and the cost of training and onboarding. The Brandon hall study found that nearly 40 percent of companies are unclear about the cost of a bad hire. Let’s start by defining what makes a bad hire. A bad hire is someone who has a negative impact on things like organizational productivity and company performance. However, a bad hire can also affect retention and thwart an otherwise harmonious office culture. Bad hires tend to be far less productive than their more efficient colleagues. They may produce significantly less or take an extraordinarily long time to complete tasks. The most serious risk is that the individual can actually end up delaying company goals and objectives. Typically, bad hires will leave a company within the first year or worse, influence other employees to leave. In many cases, high turnover rates can be attributed to hiring the wrong people. Along with being less productive, bad hires usually perform poorly compared to their peers. Moreover, they may even negatively affect the performance of your other employees. Yes, poor performance can be contagious. If one member of your team isn’t performing at the right level, it can bring everyone else down. Team dynamics often correlate with solid productivity and engagement. The bottom line? Your team can really only be as strong as its weakest link. Like I said before, your team is only as strong as your weakest link and culture is no different. Bad hires can put a damper on your organization’s culture by “creating negative morale and employee resentment,” according to Brandon Group. With the right hire, you can enhance your workplace culture and your brand. If your company has core values, be sure that the employees you hire exhibit the qualities you’re looking for. A bad hire could potentially thwart a critical deal that could cost your company thousands if not millions of dollars. It only takes one person to knock your organization completely off balance. According to the U.S. Department of Labor, the price of a bad hire (in the end) is at least 30 percent of the employee’s first year earnings. For example, a leading company reported losing $100 million on bad hires and, as a result, now offers employees a $3,000 separation bonus if they just get it over with and leave the organization within the first few months if it turns out to be the wrong fit for them. While dollars are quantifiable, it’s the intangible things that can really affect your organization. Many CFO’s rank a bad hire’s morale and productivity impacts ahead of monetary losses, according to Forbes. The reason is because it can affect your entire workforce. When someone doesn’t pull their own weight or disrespects other employees, you may actually end up losing the bad hire plus a few other A-players. The costs of this can be astronomical and can threaten your business. What Can Companies Do to Ensure they Hire the Right People? Working with a specialized recruiting firm to identify, hire and retain the right talent can help reduce the likelihood of a bad hire. If you are looking for a way to ensure you hire the best person for your health system or company, working with a professional recruiting firm is the solution. When you’re juggling running a business with everything else you have going on, it can be tough to find the time to develop a detailed recruiting strategy. Healthcare recruiters have a standardized recruiting process and the right tools to ask questions and evaluate candidates. We understand how to look for red flags by conducting behavioral interviews and can determine whether or not someone is a fit in terms of skills and culture. Your branding strategy, culture and values are top of mind while recruiters work on your behalf. We provide messages about your company’s culture and leverage our resources to communicate them effectively. Accurately representing your culture, values and priorities helps attract the right candidates. It provides candidate with more transparency about your company, what their job might be and whether or not they might be the right fit for your organization. Many organizations primarily focus on the immediate hard skills and competencies listed in the job description. While hard skills are certainly important, you can’t learn whether or not candidate exhibits behavior and personality traits consistent with your organization’s culture and values. Some candidates may carry qualities that make them good potential picks for management or leadership, while others may not have the temperament needed to be successful. The extensiveness of a good recruiter’s network is unmatched when it comes to hiring. Because recruiters work full time on hiring, they are able to build robust networks of top candidates, both passive and active. Accessing passive candidates can be hard, but the caveat is that they are often the best employees. If you really want to build the strongest team possible, attracting passive candidates from other leading organizations is a surefire way to do it. If you’re interested in building the best team you can, contact the recruiting specialists at Healthcare Recruiters International today. Whether you’re in need of Healthcare Executives, Physicians, Allied Health, or Long Term Care employees, we can and will deliver top candidates quickly to help you move your organization forward. Learn how we can help your team/ business.